Android is the most widely used Mobile operating system all around the world at the moment. Android has outgrown Apple’s iOS in many aspects. The reason for being Android so cool is its open source nature that allows developers from all around the world to come up with their ideas and enhance the operating system by means of their very own customization. Like Apple’s iOS, Android doesn’t restrict the users from going out of boundaries and tweak the OS to a maximum extent. Google’s Play Store, that is the primary source of applications for Android reached a milestone of 1 Million applications recently, that surpassed Apple’s App Store which has around 0.9 Million applications at the moment. If you happen to get your hands on an Android device, chances are you’re going to stick with some cool games, applications or tools to modify your phone’s performance. You might even get confused picking up the best applications for yourself after coming across the plethora of applications in the Play Store. There might be 100 applications for one same purpose and there might be 100 games based on one same concept, that you would actually love playing and finding out the best one out of them. Many users want to enjoy the Android applications while they do not have an Android device and many users run out of memory while loading tons of applications in their phone. In the aforementioned situation, a solution is required that will help the users to enjoy the avid Android applications without a phone or even when they run out of memory. Some users want to take their Android experience to a bigger screen. All this can be done by means of an Android Emulator on a computer. That will not only allow non-Android owners to have a taste of Android OS, but it will also sort out storage issues for users who can’t install all of their desired applications on their smartphones. Taking Android experience to a PC is pretty easy. We have already explained how you can run Android OS and install Android applications on Windows PC, but a method was required to take Android experience to Mac OS X as well. So, we are here for this purpose right now. 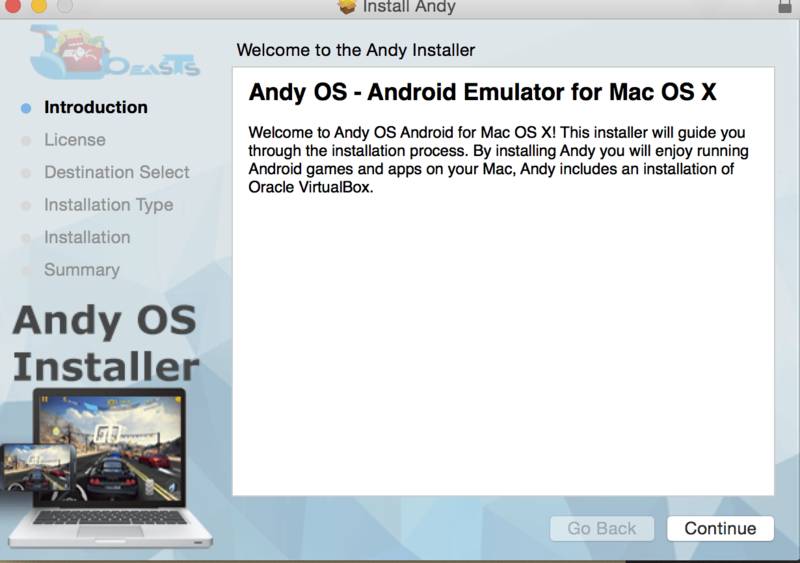 We will install Android OS on Mac OS X using Andy Emulator. After installing this, you will be able to run a virtual device powered with Android on your MacBook or iMAC. You can install all Android applications using Google Play Store within the Andy OS. Playing your favorite Android games on a bigger screen on Mac is worth it. Let’s go ahead and learn how you can do this. In case you want to have a little bit of an idea about Andy, Andy is the free Android emulator available for Windows & Mac. Andy turned out to be a great rival for Bluestacks, which is the most widely used Android emulator. Unlike other Android emulators, Andy provides a very smooth experience and a much more user friendly UI as compared to Bluestacks. Using Andy, you can also sync between your Android device and desktop computer or Mac, With this feature you will be able to use your mobile’s application on your computer as well. Other than that, Andy provides the best possible latest version of Android. Andy also provides push notifications. 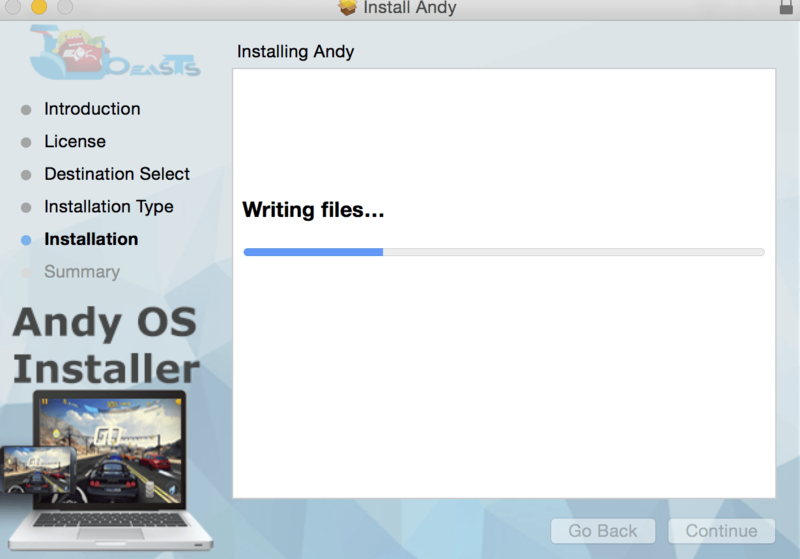 Run the Andy_OSX_vXX.dmg file and install Andy OS on your Mac. Follow on-screen instructions and finish Andy OS installation. It will take 5 – 10 minutes for the whole process to complete. Once installation is done, launch Andy from the Launchpad. Now you’re in the Android operating system and you need to setup your new Android device. Select your desired language and click on Start. If you have an existing Gmail account, use that to sign in, otherwise click on no and create a new Gmail account to setup Google Play in Andy. Once you have signed-in using your Gmail account, Andy will setup the device for you and display you the homescreen in a few minutes. Once you’re in homescreen, unlock your virtual device and click on Google Play Store’s icon in the task bar at the bottom. Find your favorite application and install it using the install button in Google Play Store. Once installed, open application drawer in Andy and find your installed application. If you can’t see your installed application on the main application screen, it is probably in the “Uncategorized” tab. You may find it there. Open your installed application and follow on-screen instructions to play or use it. That’s all with the Andy OS installation and use on a Mac with OS X. Got any issues? Don’t hesitate to reach us out through the comment box below!